Arturo O’Farrill Afro Latin Jazz Orchestra. Bobby Porcelli has paid his dues. Described by his sometime bandleader, the drummer T.S. Monk, as “the most underrated alto player of all time” and a “veritable encyclopedia of jazz discography, especially the bebop era,” Porcelli has worked with everyone from Celia Cruz to Joe Henderson. Most notably, he played for three decades with Tito Puente, and spent shorter stints with Tito Rodríguez and Machito, collectively known as the Big Three. His fellow musicians and fans look to Bobby as a kind of living legend, and are awed by his talent and versatility. Yet he is his own harshest critic. Lately, he has noticed that people are posting nice comments on his Facebook page (which he rarely checks), and that when he’s at a gig, even in such faraway places as Venezuela and Taipei, people are approaching the bandstand and asking to have their pictures taken with him. Bobby was still too young to go to bars, so he never got to see Charlie Parker in person. However, captivated by Bird’s music, he bought every one of his records and spent many hours putting Bird’s solos on “The Song Is You,” “Ko-Ko” and “Lover” down on paper. Shortly after high school, Bobby became friendly with the legendary salsa trombonist Barry Rogers. “He took me around and introduced me to so many things, taking me to jam sessions, and he’s the one who introduced me to Latin music,” Bobby remembers. Barry got Bobby into the band led by tenor saxophonist Hugo Dickens. The band played authentic jazz, Latin and R&B. Also in the band were a young Pete LaRoca and Larry Gales. They played in large halls with bad amplification and, as a result, developed big sounds in order to compensate. Bobby’s Latin career began to take off. One of his first jobs was in the band of conga player Sabu Martinez, where he got to know the timbale player Mike Collazo. One day, he ran into Collazo on the corner of Broadway and 53rd Street, outside the Palladium. Collazo told him that Tito Rodriguez was auditioning for an alto player. Bobby happened to have his sax with him, went directly to the audition, and got the job. Meanwhile, Barry Rogers also introduced Bobby to the music of John Coltrane and Thelonious Monk who, on July 4, 1957, began a six-month gig at New York’s Five Spot Café. The two would go to see the band once or twice a week, every week. Coltrane had an enormous impact on Bobby’s career, especially in terms of how he approached the music. “He was very inspiring,” he says. “Music was like a religion to him. He didn’t hang out at the bar during the breaks; he would either go out and take a walk, or be in the back practicing or trying reeds. And he was so serious about it, and quiet, and soft-spoken. The way he played did influence me for a while. I was trying to play a lot of fast runs and all of that. Even though that all disappeared from my playing – that part of the Coltrane influence – I think what stayed was to be very serious about the music. I was already serious about it, but that really inspired me tremendously. Monk’s music also exerted a big influence on Bobby. “Monk opens you up, in many ways, if you approach his music properly. It’s not just playing a song with chords, like other people’s compositions.” Early on, Bobby was also impressed with Bud Powell – whom he calls “one of the two or three greatest geniuses in jazz history” – and influenced by alto players like Benny Carter, Ernie Henry, Sonny Red, and Gigi Gryce. He also listened to Ravel, Debussy, Stravinsky, and Profokiev, and he’s a big fan of Brahms’ four symphonies. One of the greatest Latin concerts (and CDs) of all time took place at the Village Gate in 1967. The list of musicians reads like a Who’s Who of Latin jazz: Rogers, Palmieri, Porcelli and Puente, joined by “Chocolate” Armenteros, Candido, Johnny Pacheco, Ray Barretto and José Feliciano. “I remember that I was feeling really good that night,” Bobby remembers. “I had a good reed, which makes all the difference. Unfortunately, these days a good reed is hard to find,” he adds with a laugh. Today, Bobby’s style continues to blend bebop and Latin elements. Every Sunday night he performs at Birdland in Arturo O’Farrill’s Afro Latin Jazz Orchestra. If you’re lucky, you’ll hear his interpretation of “La Puerta,” a beautiful Mexican ballad. He also works in Celia Coleman’s “strictly jazz” big band at places such as the Garage Restaurant and Bar. Since the 1990s, he has been a member of T.S. Monk’s small group. 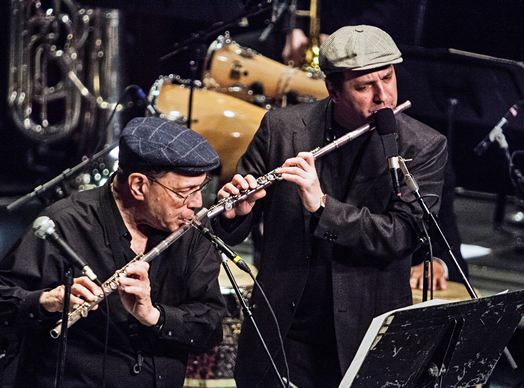 Bobby is a featured soloist on Ray Vega’s “Pa’lante” and The New Stories’ “Hope is in the Air,” featuring the music of Elmo Hope, one of Monk’s and Powell’s contemporaries. He also appears on his old friend Marty Sheller’s “Why Deny,” and over the past decade he has recorded with Cuban pianist Bebo Valdés and Dominican singer Yolanda Adams, to name a few. Bobby made two LPs as leader in the 1980s, both with Italian rhythm sections. These two albums – “Bursting” and “Rising” – are both long out of print. Peter Zimmerman’s “The Music Masters: Setting the Record Straight” is due out this fall. For information, write to PodunkPete@gmail.com. His book “Tennessee Music: Its People and Places” was published by Miller Freeman in 1998. Zimmerman previously interviewed Clark Terry for Allegro, which appeared in our January 2014 issue.